In his 2010 bestselling book, 23 Things They Don’t Tell You About Capitalism, Cambridge University economist Ha-Joon Chang made a somewhat provocative argument: the washing machine has changed the world more than the Internet has, he contended. By reducing the time that women traditionally spent on washing clothes, it contributed to a rise in female labour participation rates, to a decline in fertility rates, and transformed societies in the industrialized world, Chang argued. In contrast, economists are still searching for the productivity gains that the Internet might have brought about. As the Nobel-winning economist Robert Solow famously quipped, economists can see computers everywhere but in productivity statistics. Households from at least one large developing country may be partly vindicating Chang’s thesis by purchasing washing machines in far greater numbers than computers. Fresh data from a large-scale nationally representative survey conducted this year shows that the washing machine has become a more popular household asset than the computer in India. 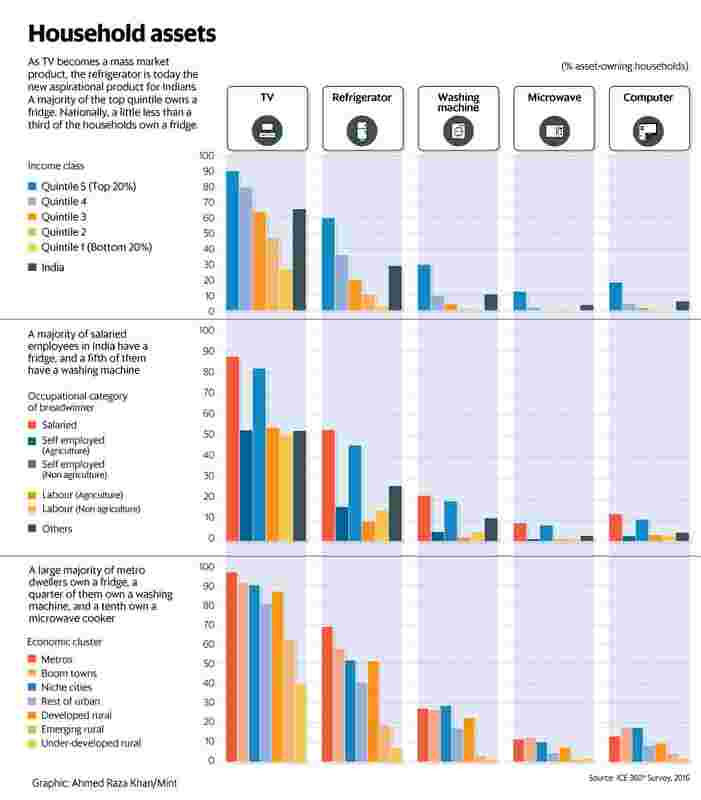 The ‘Household Survey on India’s Citizen Environment & Consumer Economy’ (ICE 360° survey) shows that 11% households own a washing machine while only 6% own a computer or a laptop. The survey covering 61,000 households is among the largest consumer economy surveys in the country. The survey shows a drop in the proportion of computer-owning households compared to the 2011 census, when nearly 10% households reported having either a computer or a laptop (the census did not report data on washing machines). The ICE 360° survey also shows that 10% households reported having an Internet connection, 1% lower than the proportion of households with a washing machine. But the proportion of households where at least one household member reported accessing the Internet (including those who accessed the Internet at work) is significantly higher at 22%. It needs to be kept in mind that while the 2011 figures were based on a complete census, the 2016 figures are estimates based on a survey and hence need to be interpreted with greater caution. Nonetheless, estimates such as these based on a nationally representative survey usually provide a fair sense of the direction of change, even if they understate or overstate the pace of change because of sampling errors. One big reason why the computer (or laptop) seems to be losing popularity is the rise of Internet-enabled mobile phones, through which most people in India access the Internet today. Nonetheless, the popularity of washing machines over computers in the land of information technology is surprising. Whether this eventually leads to gains for women in the job market remains to be seen. Other countries which saw increasing adoption of household appliances and a jump in female labour force participation rates in the industrialized world also had widespread access to amenities such as piped water, which nearly half of Indian households lack . The survey also shows that a large majority of Indian households owns a TV today. The 2011 census had showed that 47% households have a TV set. That proportion has increased to 65%, according to the ICE 360° survey. As TV becomes a mass market product, the refrigerator may be turning into the kind of aspirational product that the TV once used to be. A majority of the top quintile owns a refrigerator. A majority of the salaried class also owns a refrigerator. Nationally, 29% households own a refrigerator. The ICE 360° survey was conducted by the independent not-for-profit organization, People Research on India’s Consumer Economy (PRICE), headed by two of India’s best-known consumer economy experts, Rama Bijapurkar and Rajesh Shukla. The urban sample of the survey is comparable to that of the National Sample Survey Office (NSSO) consumer expenditure survey conducted in 2011-12. While the NSSO surveyed 101,651 households, of which 41,968 (41.3%) were urban households, the ICE 360° survey covered 61,000 households, of which 36,000 (59%) are urban households. The rural sample of the ICE 360° survey is less than half of the NSSO sample. Nonetheless, all the estimates of each region have been derived by adjusting for the respective population of those regions. A notable feature of the ICE 360° survey is that it is representative at the level of economic clusters. Urban India has been divided into four clusters: metros (population more than 5 million), boom towns (2.5 to 5 million), niche cities (1 to 2.5 million) and other urban towns (less than 1 million). Based on a district development index, rural India has been sub-divided into three different clusters: ‘developed rural’, ‘emerging rural’, and ‘under-developed rural’. The first category includes districts such as Bathinda (Punjab) and Kangra (Himachal Pradesh). The second category includes districts such as Latur (Maharashtra) and Kamrup (Assam) while the last category includes districts such as Kalahandi (Odisha) and Bastar (Chhattisgarh). The survey shows that metro-dwellers are most well endowed with household assets. Nonetheless, the penetration of consumer durables in boom towns and niche cities is roughly similar to that of metros. The proportion of households owning a refrigerator is relatively lower in boom towns and niche cities compared to metros but the proportion of households owning a computer is relatively higher in boom towns and niche cities. The survey also shows that the penetration of consumer durables is greater in developed rural areas than in smaller urban centres (classified as ‘Rest of urban’ in the analysis). Tadit Kundu in Mumbai contributed to this story. This is the ninth of a 16-part data journalism series on how India lives, thinks, earns and spends, based on the latest results from the ICE 360° survey (www.ice360.in/) conducted by the People Research on India’s Consumer Economy (PRICE) in 2016. The next part will look at how Indians access and use the Internet.